The place to talk writing, music, expressive arts, mental health, and healing. Hysteria Radio is a podcast and internet radio show that focuses on writing, music, expressive arts, and all things related to self-care and recovery from or management of a mental health condition. Host Joseph Fusaro has published 6 poetry books and a short guide featuring the changes he made to start feeling alive again after living his teen years and 20’s with serious mental illness (schizoaffective, bipolar, ... See More general anxiety disorder, chemical dependence, depression, insomnia, agoraphobia). He is also a professional speaker and has worked with, and continues to work with NAMI, This Is My Brave, Project 375, and Deconstructing Stigma. 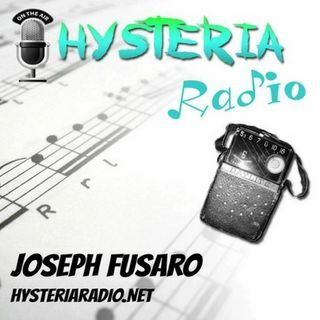 On Hysteria Radio, Joe speaks with guests about using their gifts and talents in order to learn how to manage symptoms, follow their passion, or just to learn how to start feeling again. Guests have included touring musicians, best selling authors, experts in their field, to the everyday writer that keeps a journal in order to maintain their health and wellness. Topics include mental health, journaling, creating, performing, self care, exercise, meditation/yoga, recovery, inspiration, among many others.